If you have never floated down the Buffalo National River in the Ozarks part of the state, then you are missing out on what some call the Eighth Wonder of the World. The Buffalo River is a truly remarkable place. But if you need a few reasons to get started, here are four reasons to canoe the Buffalo National River with Dirst Canoe Rentals. Most of us live in a chaotic world. We wake up, go to work, run errands, check off to-do items, eat, and sleep. The constant stress and being connected to screens can really take its toll on the human body. According to the site Statisticbrain.com, 77% of adults in the U.S. say that they regularly experience physical symptoms of stress. Taking a day to check out of your regular schedule can also have a huge impact on your stress levels and your body. In fact, a quick search on the web will tell you that getting close to nature is one of the best stress relievers out there. When you take a canoe trip down the Buffalo River, your eyes are filled with images of the most beautiful part of the “Natural State”. You are instantly taken to another place and easily forget about the troubles and stress of your daily schedule. And because it’s truly all-natural, there are no side effects. Buffalo River canoeing trips are a great way to bring people together. For families and friends who already know one another, it gives them a time to reconnect. For example, if you are the parent of a teenage son or daughter who really doesn’t say a lot these days, renting a canoe for a day from Dirst Canoe Rentals may be just what you need to break through. Though the Buffalo National River is quite tame compared to many rivers, you will still be forced to communicate and work together to paddle the course of the float trip. Did we mention that cell phone service can be spotty on the river? Choosing to canoe down the river is also a great way for businesses and organizations to team build. And even if you don’t fully know the group you choose to float down the river with, the Buffalo River has a way of bringing people together and creating memories for a lifetime. 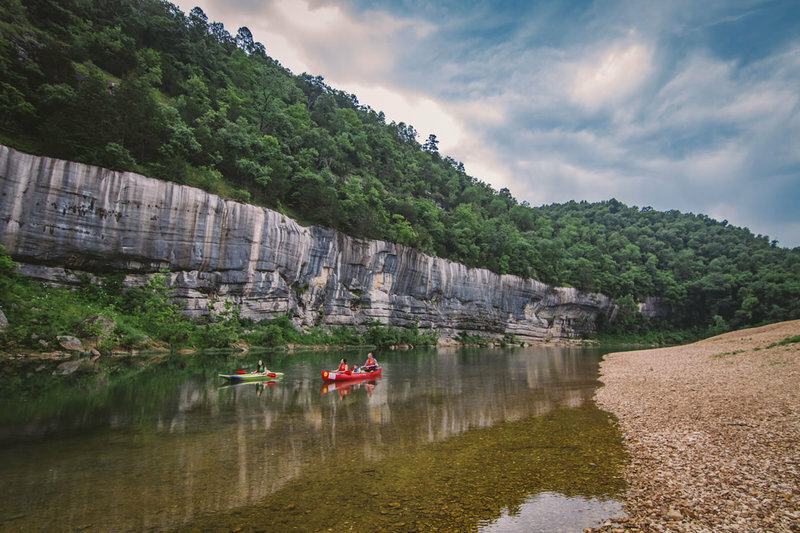 Not only is canoeing the Buffalo River a great way to reconnect or get to know people, it is also a great activity that won’t break the bank. If you are just getting your feet wet with the outdoor sport of canoeing, renting your gear from Dirst Canoe Rentals is a great place to get started. From 1 to 15 or more canoes and kayaks, Dirst Canoe Rentals can get you and your crew started on your Buffalo River adventure with very little money. Check out Rates page for all the details or give us a call if you are planning a big group event. 4. DIRST CANOE OFFERS FUN FOR EVERYONE! When it comes to canoeing, there is no better place than the Buffalo National River. It truly has something for everyone in your group. And when it comes to canoeing the Buffalo, Dirst Canoe can also help you plan one adventure you won’t forget. If you are just starting out, we offer 4-6 hour float trips, and for the more skilled, we offer 14-day trips. It’s also good to know that no experience is necessary when canoeing the section of the Buffalo River that is used by Dirst Canoe Rentals. If you have any questions, feel free to give us a call. And don’t forget that we also offer cabins to stay in after your long day on the Buffalo.